One of the themes at SCTE this year was 3D (as it has been at conferences throughout the industries). 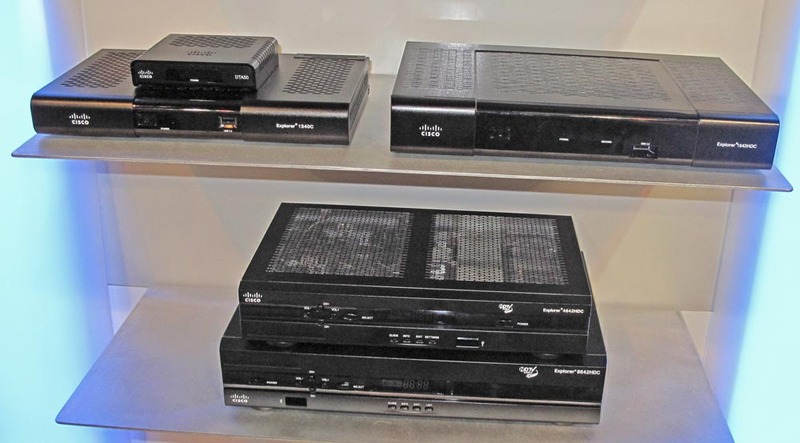 Shown at the right is a soon-to-be-announced Sony LCD TV capable of showing 3D video. 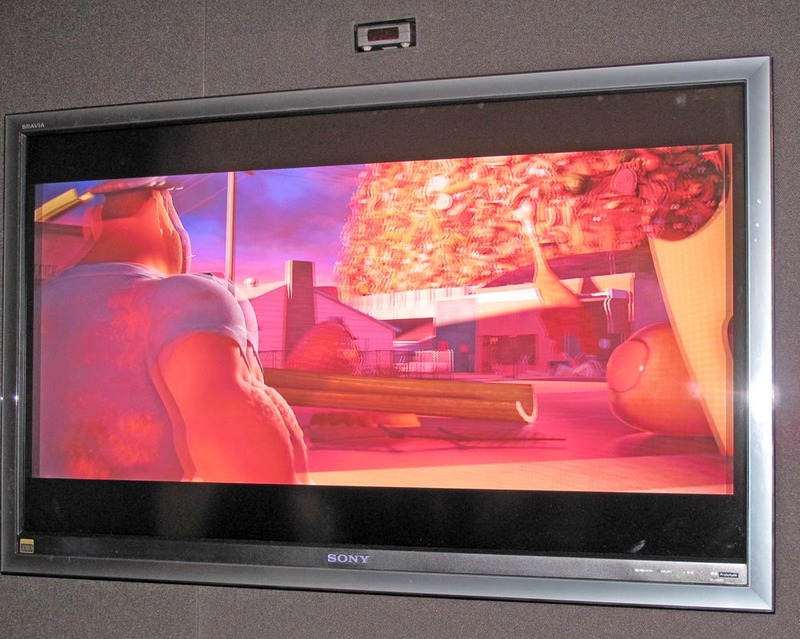 Their demo was based on a Blu-ray source, played on a modified PS3. In theory, they can display in "triple flash" at full 1080, full frame. However, since this setup still used HDMI 1.3, some compromise was made. DIGDIA has a report on 3D if you are interested. 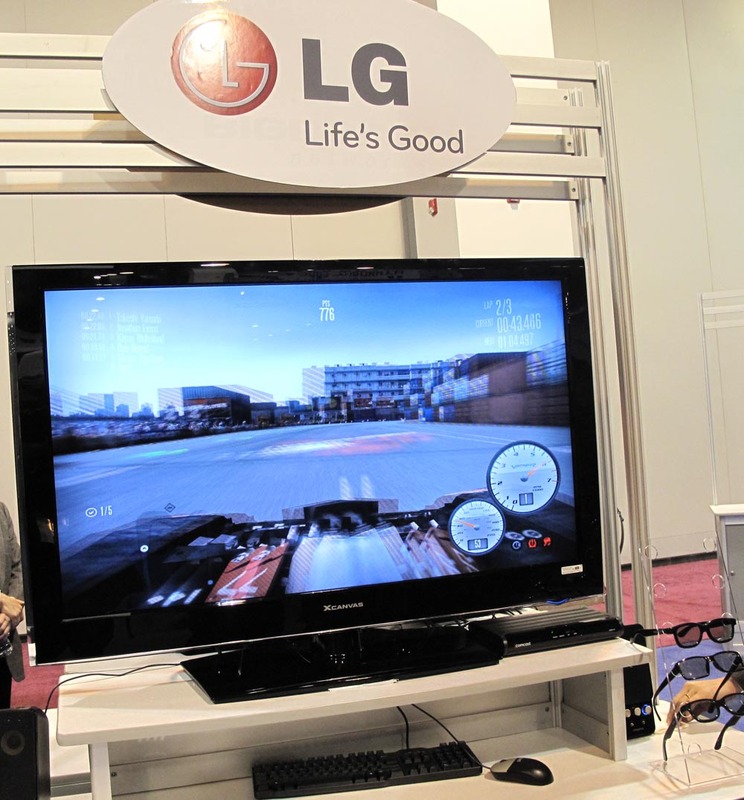 LG was showing their LCD 3D set. Unlike the Sony, which used an active shutter glass system, the LG TV used alternating lines for L and R images, so a passive set of glasses can be used with some loss of resolution. 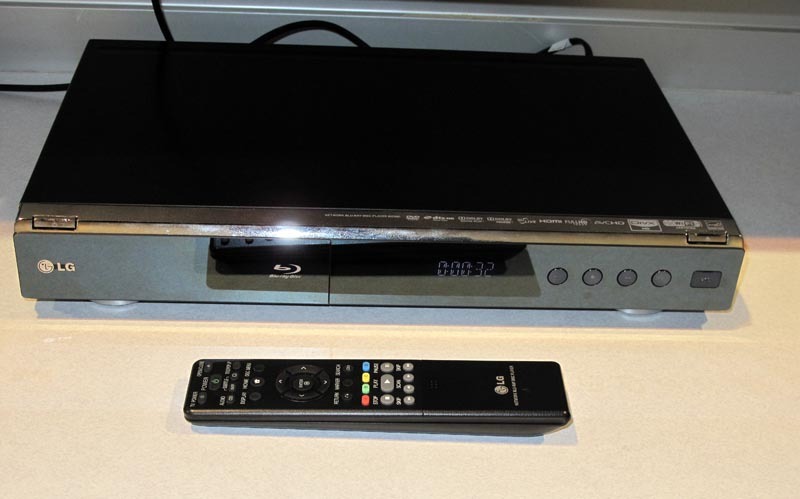 The LG TV to the left was driven by their Blu-ray player, shown here, but not yet released. 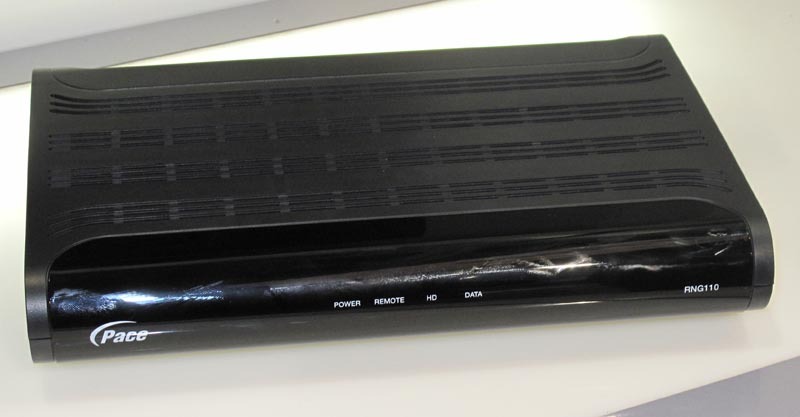 Also shown in the prototype Panasonic Blu-ray player for 3D. Excuse the poor photo because it was behind a plastic window. Hyundai also showed their LCD 3D set. Similar to LG, they alternated the L and R images on each pair of horizontal lines. The image to the left gives you an idea of what this looks like up close. Pace was the STB used for another 3D demo that showed off a Comcast 3D feed. 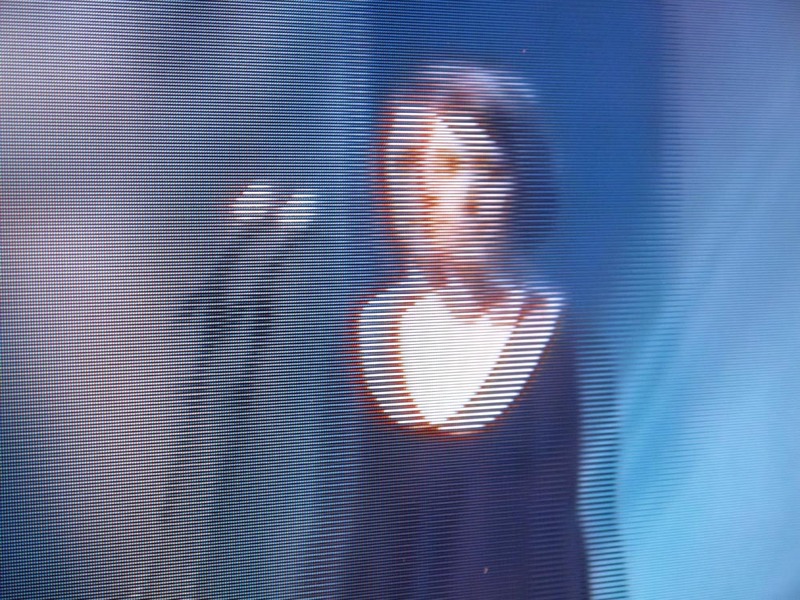 The video stream used the "over-under" method where the left and right images are combined in one frame, each half resolution and one over the other. The Pace STB, it turns out, simply passed this onto the TV like any other HD image - so, the TV did the conversion for the viewer. Perhaps the other major theme, though less visible, is Advanced Advertising. The relatively new SCTE 130 standard is helping to spark some interest in the topic. One can target ads, in theory, down to an individual subscriber. 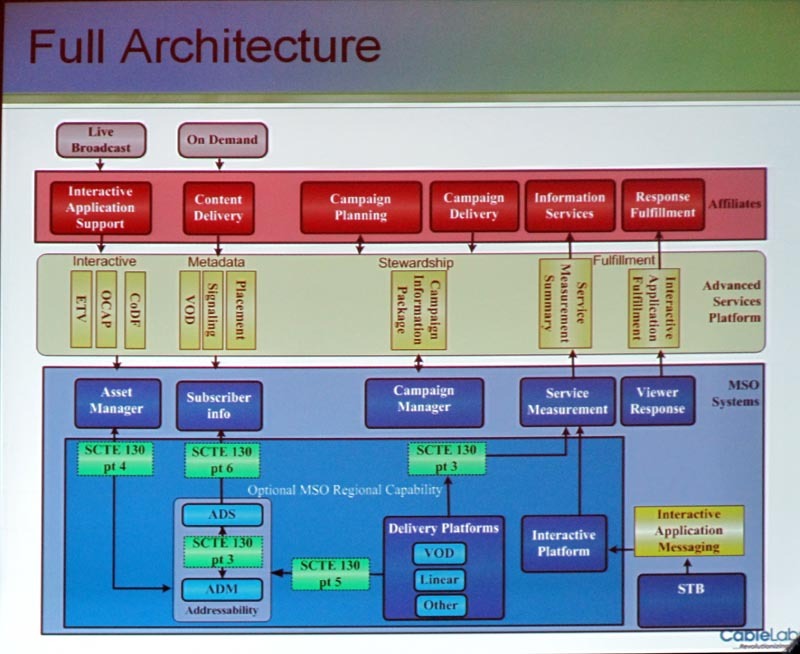 Lots of issues still exist, but the diagram to the right shows a block diagram of how it works. 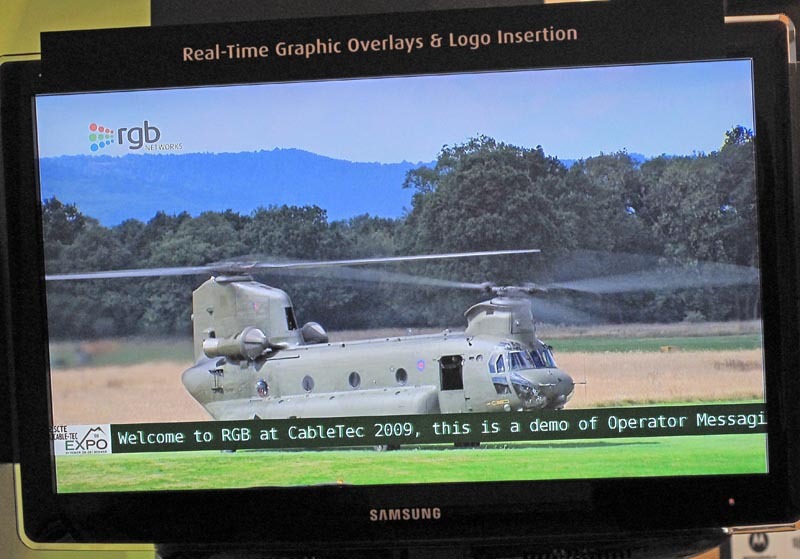 RGB showed their video overlay technology in the context of SCTE 130. They have the ability to put logos, crawls and video on the screen on individual subscriber screens using their grooming technology. One of the issues has a little less to do with technology than business models. Many different players will want to have a hand in the management of targeted ads. The Tandberg slide to the left indicates a vision for how one might approach this conflict of agendas. 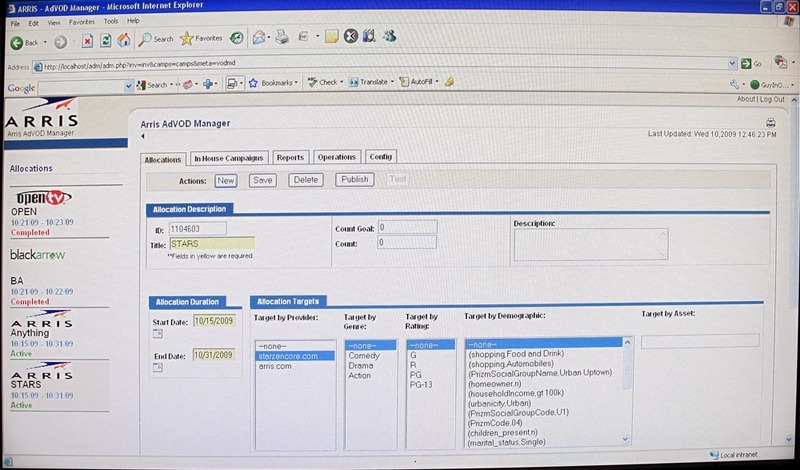 The screenshot to the left is from Arris - one of the vendors showing ad management software. In this case, the software is a prototype that they hope to release in the future. 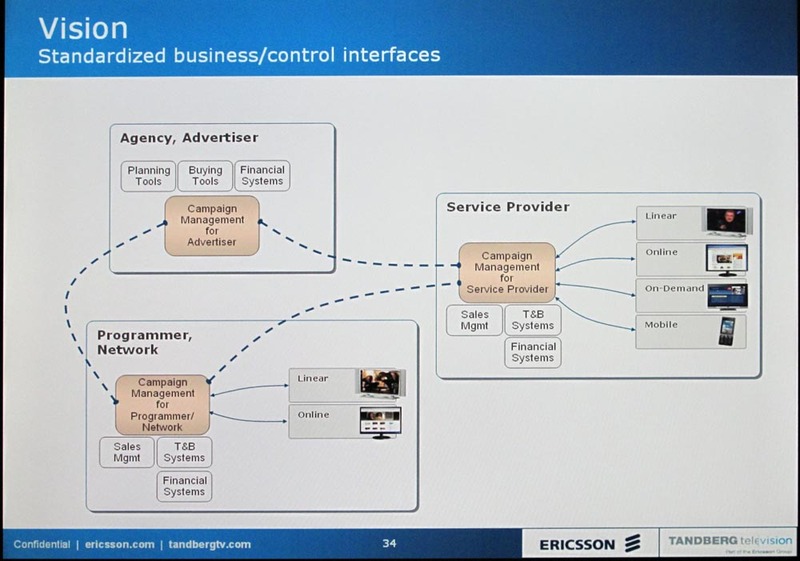 This screenshot shows just part of the complexity that MSOs will have to face in the future as, or if they jump into micromanaging which ads the subscriber gets to see. tru2way is still very topical as it begins to move into more deployment. 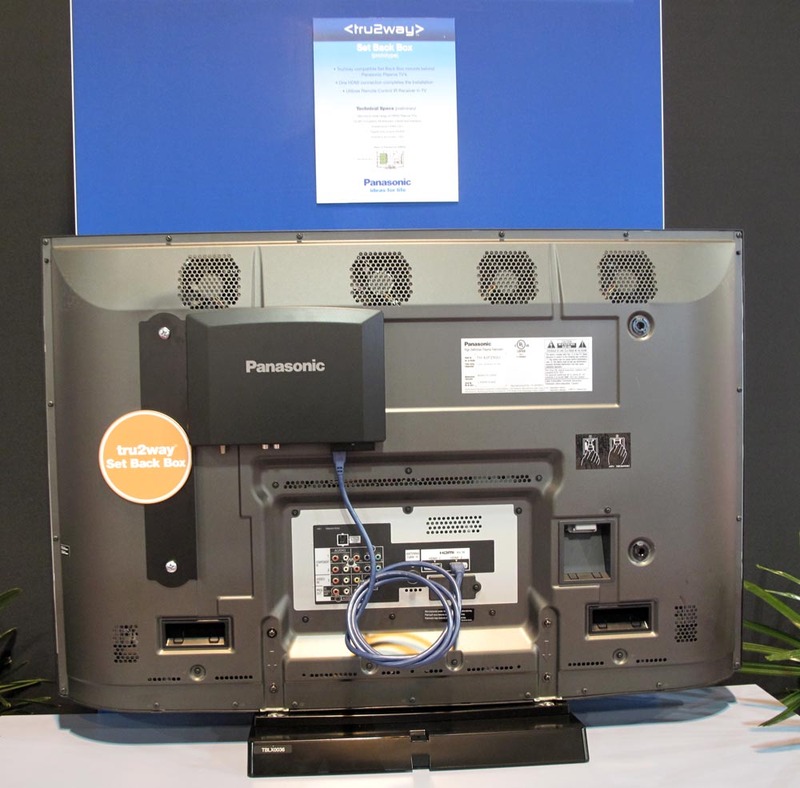 However, the pioneering vendors like Panasonic are still experiencing slow adoption as the number of markets is still very low. Nonetheless, here is an interesting STB (or rather, Set Back Box) intended to mount on the back of a panel TV. It supports tru2way. Not out yet, but perhaps within a year. The Scientific Atlanta brand is now totally buried in favor of the Cisco brand. The STBs shown to the right also support a more standardized room-to-room video based on MoCA (prior S-A STBs sent video between rooms via a QAM signal in an upper band). One still needs to be careful where to put the video amplifier if one is used. 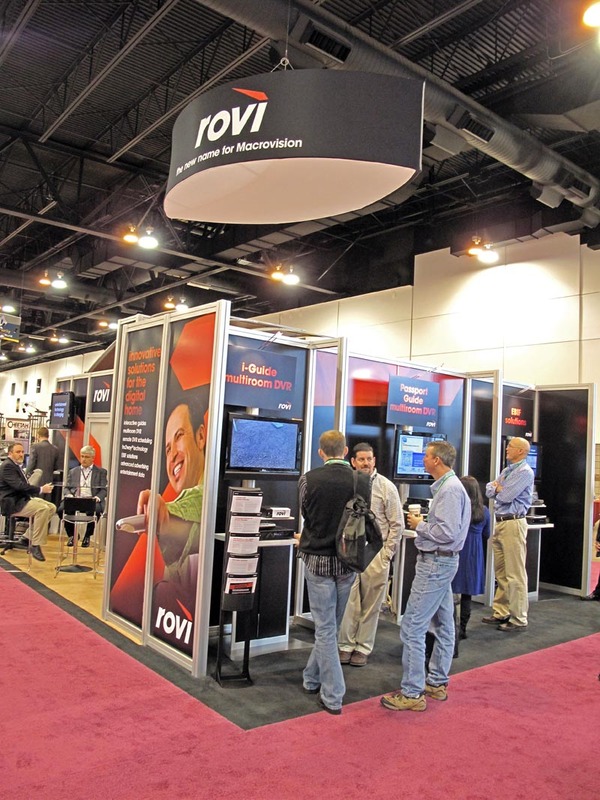 Macrovision is also going through a rebranding name change - they are now calling themselves Rovi. The change is because the Macrovision name made too many people think of their old content protection systems. Now that they have branched out into many more things, they now have a new name.